Check the Fien Print: Riding with FX's "Sons of Anarchy"
Last night built up, with growing enthusiasm, to the premiere of The CW's "90210," which ended up -- with an audience of just under 5 million -- either being the most watched scripted program in CW history or the least watched installment over "Beverly Hills, 90210" ever. The CW would like you to concentrate on the former and ignore the fact that despite the endless promotion and pimpage, "90210" failed to outdraw a successful episode of "America's Next Top Model," much less show that The CW is ready to compete with TNT. Fair nuf. In any case, tonight's options are a bit less exciting. In the interest of equal time, I'll watch Sarah Palin's speech from the RNC, but that's only because I've already seen "Bones" (great use of London and lots of effective comedy) and "ANTM" (almost unwatchably bad this cycle). And because I've seen FX's "Sons of Anarchy." While there are many reasons to like the FX bike gang drama, I suspect it will probably join the ranks of FX series that I watch in the initial batch of screeners and subsequently am unable to keep track of, either because I forget when they're on or I forget that they're on at all. Actually, USA shows have started to fall into that category as well. I like them well enough. But not well enough to become devoted. It's amazing I can still keep up with "Mad Men," actually. #127. Inside every crime syndicate lurks a dysfunctional family (literal or figurative). #234. Inside every dysfunctional family lurks a crime syndicate (literal or figurative). If you've established these parameters watching shows from "The Sopranos" to "The Riches" to "Breaking Bad" to "The Black Donnellys" to "Skin" ("His father is the district attorney!!!") 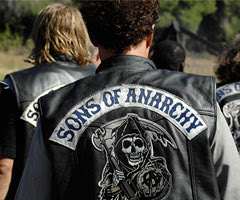 to "Brotherhood" to "Cane," then "Sons of Anarchy" will probably seem at least vaguely familiar. Granted that the milieu is mostly fresh. "Sons of Anarchy" follows the adventures of the eponymous biker gang, a group of ruffians who bike, brawl, drink, laugh and love. They also move guns and are perfectly at ease with killing off their competition, should that be required. They're scruffy, tattooed and largely amoral, but they love each other, at least when they aren't conspiring against each other or experiencing existential crises about their place in the world. Adding to the sense that this gang of outlaws is as thoughtful as they are rowdy is series creator Kurt Sutter's conviction that these characters are Shakespearean, or at least conform to mighty basic Shakespearean archetypes. Our hero is Jax (Charlie Hunnam) son of the deceased creator of the Sons of Anarchy. While going through his dead dad's stuff, he uncovers a memoir containing his father's regrets about the direction of the club, regrets that dovetail nicely with Jax's own concerns about his mother's (Katey Sagal) marriage to the gang's co-founder (Ron Perlman). The memoir may not exactly be the Ghost of Hamlet's Father and Jax's junkie pregnant ex-wife (Drea DeMatteo) may not exactly be Ophelia and Sagal's character is more Lady Macbeth than Gertrude and the closest to a direct reference to the Bard is to "Henry the 4th," but most viewers will get the point. OK. That's optimistic. Most viewers probably couldn't pick out a "Hamlet" reference if they smelled something rotten in Denmark lurking under the cushions of their couch. But it's there. And I'm always happy with a little Shakespearean free association. Setting "Hamlet" against the backdrop of a West Coast biker gang isn't close to the trickiest transposition I've seen attempted. But I kept being distracted by so many things. Hunnam had what ought to have been a star-making turn in "Green Street Hooligans," a very similar "outlaws-as-family" conceit. I didn't love the movie, which was formulaic and hackneyed, but Hunnam's gave a statement performance, on a level with Malcolm McDowell in "A Clockwork Orange" in terms of making a sociopath look both welcoming and terrifying. From "Undeclared" to "Cold Mountain" to "Children of Men," Hunnam has frequently been excellent and as long as he keeps his mouth shut in "Sons of Anarchy," he's a fine lead here. But Hollywood casting directors seem to think that no role is so American that it can't be played by a Brit with a bad accent and Newcastle-born Hunnam's accent is horrible and the effort to flatten out his speech drains the life from many a monologue. It's not that he isn't a good enough actor to play opposite Perlman and Sagal -- both threatening and excellent here -- but this is the wrong context. Even if Hunnam's accent weren't enough of a bother, I kept drifting back to the idea that the show wants us to root for and revel in the attempts by a mostly white biker gang to keep the Mexicans and blacks out of their pure community. The Sons of Anarchy aren't without the occasional hint of ethnicity, but it's unqualified ethnicity or pointlessly quirky ethnicity, like Mark Boone Junior as the club's treasure, a Jew with an odd musical hobby. As with the mobsters in "The Sopranos" or the prisoners on "Oz," Sutter never lets viewers forget that we're empathizing with criminals, but the SoA's adversaries are so grotesque -- right down to Mitch Pileggi, as an unlikely Neo-Nazi -- that the deck is stacked. The supporting cast of "Sons of Anarchy" is stuffed with actors who interest me or are doing interesting work. In addition to the ever-welcome Boone, I was glad to see Dayton Callie, Johnny Lewis, Maggie Siff, Kim Coates and Sprague Grayden getting work, even if everybody in the cast seems a bit too proud to be playing inked-and-scuzzy.